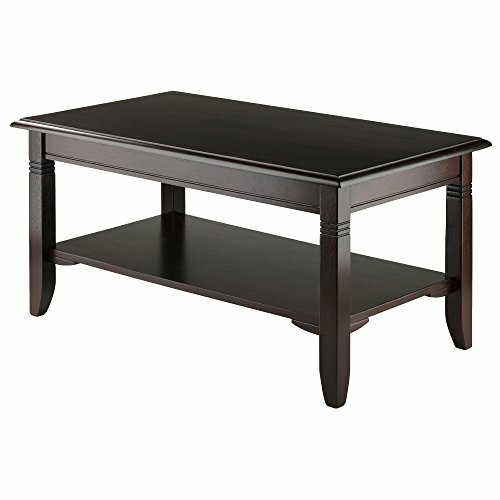 A coffee table is a low piece of furniture usually placed next to or in front of a sofa. It has a variety of uses including supporting beverages—and no, not just coffee—as well books, magazines, and other decorative or small items. Although a small piece of furniture, it is usually the center of one’s living room and is often used. Thus, manufacturers have been trying to find ways on how to make their versions of coffee tables stand out in the market. Among those who have done so is Winsome Wood. They began distributing and manufacturing wood housewares in 1977. They are now considered one of the leading lifestyle furniture brands which offer innovative designs with a balance between affordability and craftsmanship. They also do customizations while creating their own product designs which make customers enjoy and appreciate their flexibility on top of their best customer service. It is only but right to dedicate this article to the comprehensive review of the Winsome Wood Nolan Coffee Table. We will focus our discussion on its features, highlights, some minor drawbacks, so you can be guided about what to expect and make a comparison to other products so you can also get to know other options available for you. This coffee table is made up of solid and composite wood which make it durable and strong. Assembly is required but can be easily done by following the instructions that the package comes with. The table is rectangular with curved and carved legs and is made with cappuccino finish for a more conventional and polished look. It has an ample top space that you can use to support beverages, magazines, books, or small decorations. The bottom shelf, on the other hand, can be used as a storage space or a shelf for artwork display. The table’s overall measure is 37 inches wide, 21 inches deep, and 18 inches tall. The shelf measures 32.8 inches wide, 16.8 inches deep, and 8.3 inches tall with a distance of 5.5 inches from the floor. It has clean, traditional lines which make it look simple and classic. It is made up of high-quality solid wood which makes it durable and robust. Its cappuccino finish adds to its traditional feel and look. It is easy to construct and can be easily wiped clean to maintain its beauty. It has a large shelf clearance for more storage space. The table is solid and can be easily moved around the corners of your house. The finish may look cheap up close and can be easily scratched. The tabletop can be easily stained so you may need to re-paint at some point. The Winsome Wood Nolan Coffee Table is made up of high-quality solid and composite wood. It can easily be assembled by following the instructions that the product comes with. It has a cappuccino finish which gives it a traditional and polished look. It is rectangular with legs which are carved and curved. The table has a wide top to support beverages, magazines, books, or decorations and a large bottom shelf which can be used as storage or space for artwork display. It has a polished finish which can be easily wiped clean. It is solid and strong, and it can be easily moved around the corners of your house. Aside from the Winsome Wood Nolan Coffee Table, below are the other products of the same genre which are popular on the market today. This rectangular coffee table has a sturdy hollow core and a laminate espresso finish. It has two storage shelves with a divider on the bottom shelf where you can keep your books, magazines, remote controls, or other small items organized. It can easily be assembled, although it is recommended to have two adults work on the assembly due to its size. It has a larger space that measures 17.7 inches in height, 41.5 inches in width, and 19.5 inches in depth. The top and middle shelf can hold up to 100 pounds, and the lower shelf can help up to 50 pounds. This wood coffee table has a country style elegant charm and has a two-tone painted pine wood. It comes with a neutral wood tone surface with white-painted legs. The table is made of high-quality wood which is sturdy, durable, and long-lasting. It measures 47 inches x 23.5 inches x 18 inches and weighs 24 pounds. The package comes with instructions and can be easily assembled in minutes. If you are after a traditional and old-fashioned feel and appearance, the Winsome Wood Nolan Coffee Table can serve as your ideal center furniture. It has clean lines and has been designed with simplicity. It is solid and strong due to the high-quality wood material that it is made up of and for a very reasonable cost. It has a large shelf clearance for storage or display purposes. The cappuccino polished finish also makes it easy to wipe clean. On the other hand, the Ameriwood Home Jensen Coffee Table, although larger than the Winsome Wood Nolan Coffee Table, is the cheapest option. It also has two shelves with a divider on the bottom shelf for more storage space, perfect for keeping your stuff organized. Due to its bigger size, it is recommended to have two adults assemble the table. If you prefer a neutral color, however, the Zinus Farmhouse Wood Coffee Table is the best option. It has white-painted legs and a neutral wood tone surface which gives it a country style elegant charm. It has a spacious top, but it does not have shelves, unlike the first two coffee tables. Overall, we can say that the three products above have their winning features and drawbacks. And although they differ in size, shape, materials, features, and style, they all serve their main purpose which is to support beverages, books, and other things. In this case, the make or break factors are your budget, space, preferred materials used, and the personal style.